216 pages | 7 B/W Illus. The growth of rights defence movements in China reflects the increasing capacity of Chinese citizens to shape their own civic discourse in order to achieve diverse goals. Rights defence campaigns have taken novel forms which are unprecedented in China, including the use of the Internet by rights campaigners, the development of rights entrepreneurs, and the selection of representatives and leaders in rights defence campaigns. Defending Rights in Contemporary China offers the first comprehensive analysis of the emergence and development of notions of rights defence, or weiquan, in China. Further, it shows that rights defence campaigns reflect the changing lives and priorities of Chinese citizens, both urban and rural, and the changing distribution of power in China. The Chinese government first used rights defence to promote the law and protect the rights of the weak. But the use of rights defence strategies by private citizens, and lawyers also demonstrates changing power structures – in areas as diverse as private property rights, rights for the handicapped, corruption claims and grievances with officials. In this book, Jonathan Benney argues that the idea of rights defence has gone from being a tool of the government to being a tool to attack the party-state, and explores the consequences of this controversial activist movement. This book offers essential insight into the development of rights in contemporary China and will be highly relevant for students, scholars and specialists in legal developments in Asia as well as anyone interested in social movements in China. 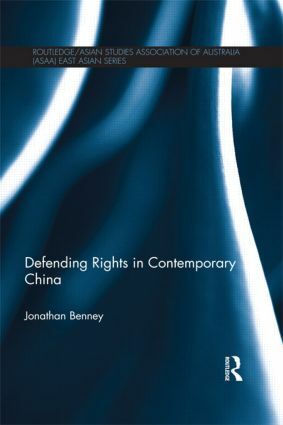 "This engaging book provides essential information and analysis on the emergence and implications of the phenomenon of rights defenders… Jonathan Benney’s useful book provides an excellent treatment of the emergence of the rights defence movement and so invites better understanding of the development of China’s socialist legal system generally. This valuable book will be useful reading for specialists on China’s legal and political systems, as well as for graduate students and others with reasonably advanced levels of knowledge on contemporary China." - Pitman B. Potter, University of British Columbia, Canada; China Information, 2013. 1. Introduction 2. The Development of the Term weiquan 3. Government Rights Defence 4. Citizen-Initiated Rights Defence 5. Legal Rights Defence 6. Conclusion: Why weiquan? Jonathan Benney is a postdoctoral fellow at the National University of Singapore’s Asia Research Institute.